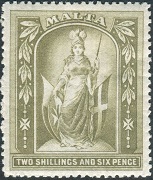 Only Malta stamps of the 1/2 Penny denomination were issued between 1860 and 1885. They were printed in various shades of Buff and on papers with various watermarks. This would explain the abundance of Great Britain stamps that were used concurrently with the 1/2 Penny stamps of Malta during this time period. The two 1/2 Penny denomination stamps shown above, one on white paper and the other on bluish paper, were issued between 1861 and 1863. These Malta stamps are typographed, perforated 14, and they are printed on unwatermarked paper. 1/2 P. (1863 - Scott #1) - Buff on White, Pale Buff on White. 1/2 P. (1861 - Scott #1b) - Brown Orange on White. 1/2 P. (1860 - Scott #2) - Buff on Bluish. 1/2 P. (1875 - Scott #3) - Yellow Buff. 1/2 P. (1863 - Scott #3a) - Buff. 1/2 P. (1867 - Scott #3b) - Brown Orange. 1/2 P. (1880 - Scott #3c) - Orange Yellow. 1/2 P. (1864 - Scott #3d) - Bright Orange. 1/2 P. (1870 - Scott #3e) - Dull Orange. 1/2 P. (1872 - Scott #3f) - Orange Buff. 1/2 P. (1877 - Scott #3g) - Pale Buff. 1/2 P. (1881 - Scott #3h) - Yellow. 1/2 P. (1874 - Scott #4) - Golden Yellow (aniline ink). 1/2 P. (1865 - Perf. 12 1/2 - Scott #5) - Buff, Yellow Buff. 1/2 P. (1878 - Perf. 14 x 12 1/2 - Scott #6) - Buff. 1/2 P. (1879 - Perf. 14 x 12 1/2 - Scott #6b) - Yellow. 1/2 P. (1878 - Perf. 12 1/2 x 14 - Scott #6a) - Buff. The 1/2 Penny denomination stamp was again re-issued on white paper with WMK 2 - the Crown & CA watermark - between 1882 and 1884. This stamp is perforated 14. 1/2 P. (1884 - Scott #7) - Reddish Orange. 1/2 P. (1882 - Scott #7a) - Orange. On January 1, 1885 the color of the 1/2 Penny denomination stamp was changed, and five new Malta stamp denominations were introduced. These Malta stamps are all perforated 14, and they are printed on paper with WMK 2 - the Crown and CA watermark. In 1886, the new large-format 5 Shilling stamp shown above was issued. This new high-denomination stamp is printed on paper with WMK1 - the Crown and CC watermark. 1/2 P. (1885 - Scott #8) - Green. 1 P. (1885 - Scott #9) - Carmine Rose, Rose. 2 1/2 P. (1885 - Scott #11) - Ultramarine, Bright Ultramarine, Dull Blue. 4 P. (1885 - Scott #12) - Brown. 1 S. (1885 - Scott #13) - Violet. 5 S. (1886 - Scott #14) - Rose. 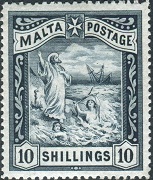 Between 1899 and 1901, the first pictorial definitive stamps of Malta appeared. The three lower denominations are shown above. These stamps are all engraved, and they are printed on paper with WMK 2 - the Crown and CA watermark. 4 1/2 P. (1899 - Scott #15) - Gozo Island Fishing Boat. 5 P. (1899 - Scott #16) - Ancient Galley. 1 F. (1901 - Scott #19) - Valletta Harbor. The two high denomination pictorial definitive postage stamps shown above were also issued in 1899. 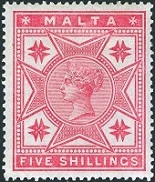 These Malta stamps are engraved, and they are printed on paper with WMK 1 - the Crown and CC watermark. 2 1/2 S. (1899 - Scott #17) - Melita - The Allegory of Malta. Melita is the personification of Malta and of the Maltese people. The name originated from the Ancient Roman town of Melite, which was destroyed and re-built several times over the centuries. It is now the town of Mdina. Melita appears on the 1899 Two Shilling Six Pence stamp wearing a loose-fitting garment and a helmet. She holds a sword in one hand and a shield, emblazoned with the Maltese Cross, in the other hand. Behind her are the flags of Malta and of the Order of Saint John. 10 S. (1899 - Scott #18) - St. Paul, after his Shipwreck at Malta. In A.D. 60, the Apostle Paul (A.D. 5 - A.D. 67) was being taken from Judea to Rome, to be put on trial for inciting rebellion. The Roman galley was wrecked during a violent storm, and St. Paul and the other 274 people on board swam safely to an island, what is today, St. Paul's Island in Malta. Paul converted the Roman Colony of Malta's governor and its inhabitants to Christianity, giving Malta the distinction of being the first Roman Colony to be converted to the new faith. The design is a modified version of a 19th Century drawing by Paul Gustave Doré (1832-1883), showing the Shipwrecked St. Paul on land, with the Roman galley sinking in the distance. The two watermarks used for the stamps of Malta, from 1863 through 1902, are illustrated above. They will be referred to by their watermark numbers in the text descriptions. On July 4, 1902, a large quantity of the 2 1/2 P. denomination stamps of 1885 were overprinted and re-valued to One Penny (Sc. #20). A rather common overprint error of the 1902 re-valued 2 1/2 Pence stamp is shown above (Sc. #20a). These errors have the revaluation spelled as "ONE / PNNEY". They are actually quite inexpensive these days.